Crows Nest Cottage is a recently refurbished New Forest Holiday Cottage, which has been decorated to a high standard throughout; it is one of the prettiest Victorian cottages in Lyndhurst, in the heart of the New Forest, Hampshire. 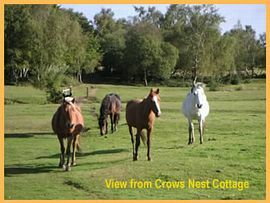 The open forest is but a few strides away, where New Forest ponies, donkeys and cattle graze just yards from the front door. Lyndhurst village centre with its wide choice of cafes, pubs and restaurants is only a few minutes walk away. 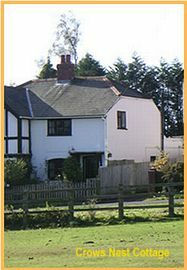 Sleeps 4, two bedrooms 1 double & twin bedroom. Large open fire, TV, & DVD and CD player. Modern kitchen; dual fuel range cooker, fridge, washing machine. Dining area with table and seating. Modern bathroom complete with bath and shower unit. One well behaved dog, with own bed, welcome. A warm welcome always awaits you. Turn off the M27 to Bournemouth at junction signed Cadnam and Lyndhurst. Proceed for 300 yards to a roundabout where you take the third on the left to Lyndhurst. Upon arriving in Lyndhurst after 3 miles, take the first on the left, Race Course View. Crows Nest Cottage is 150 yards on the right. £380.00 to £695.00 according to time of year.